Flip Master Online is an online Sports game which can be played at Plonga.com for free. Flip Master Online has a rating of 4.5 stars (out of 5) and it has been played 6454 times now. 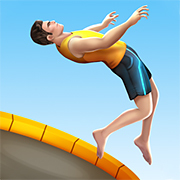 Please go to our Sports games section if you want to play more games like Flip Master Online! Master the trampoline and perform frontflips, backflips, and other stunts in this super fun online version of the hit-game Flip Master!